Summary: The American spiritual “He’s Got the Whole World in His Hands” is one of the best known songs of all time, sung in churches, schools, and camps throughout the country. Who created the first version of the folk song is unknown and most citations simply credit “various” authors, acknowledging the history of spirituals as songs that have been passed orally from person to person and generation to generation. The words chosen by the author of this picture book may not match those you have sung in your tradition, but the mood and message remain the same. Literary elements at work in the story: The inspirational content of spirituals was crucial to the slaves who created them. Simple rhythms and repetitive phrasing made them easy to memorize, sing, and pass along. The term spiritual is derived from spiritual song – a song of faith that finds its roots in Ephesians 5:18-20 – “But be filled with the Spirit, as you sing psalms and hymns and spiritual songs among yourselves, singing and making melody to the Lord in your hearts, giving thanks to God the Father at all times and for everything in the name of our Lord Jesus Christ.” This American spiritual was first published in 1927 and has been sung and recorded through the years by a number of choirs as well as pop musicians. 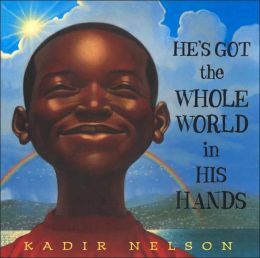 How does the perspective on gender/race/culture/economics/ability make a difference to the story: Inspired by this song’s simple message, Kadir Nelson sought to capture on paper the joy of living in and engaging with the world. He envisioned a multiethnic family, representative of the earth’s diversity, and chose San Francisco as his setting with its oceans and seas, mountains and rivers which provide a perfect complement to the lyrics of the song. When asked about the inspiration of his illustrations, Nelson said he “wished to portray the world as a child might see it, vast and beautiful” and his artwork created with pencil, oil and watercolor does just that. Mixed in with his realistic illustrations are “kid-drawings” created with colored pencils by Nelson using his left hand to create art within art. Theological Conversation Partners: Psalm 24:1 declares, “The earth is the Lord’s and all that is in it, the world, and those who live in it.” This spiritual celebrates this declaration in ALL CAPS! As God’s creation, we are connected one with another through all of time and space. As children of God, we are created to be in relationship with our Creator AND with each other. The beauty of this book is in the artwork that portrays a family enjoying nature and time together. They fly kites, watch the sky, play board games and take walks together as a family that values each other in the midst of God’s created order. As a family of faith, we often have the privilege to reach out to those beyond our biological families in ways that show appreciation for the beautiful creatures we all are. By expanding our view to include God’s whole world we open ourselves to full acceptance of others and open relationships that can bring richness into our lives in ways we can only imagine. The boy in this book is part of a family of six people of different ages, genders, colors, and sizes. How do you define family? What does your family look like? Who do you consider to be a part of your family? Who would you include in your “extended family?” Grandparents, aunts and uncles, cousins, close family friends? Who would you include in your “faith family?” Friends at church, friends in your community? What do you like to do with your family? Why do you enjoy those activities? What makes them special to you? How can you celebrate the gift of family with those you love? How can you say thank you to God for the gift of your many families? This review was written by regular contributor Krista Lovell. He’s Got the Whole World In His Hands by Storypath is licensed under a Creative Commons Attribution-NonCommercial 4.0 International License.